Steve Winwood didn't just survive the '80s, he conquered the decade. After coming up as a teenage soul-singing prodigy with the Spencer Davis Group, then expanding the bounds of rock with free-thinking Traffic (with a short stopover in Blind Faith), Winwood stood alone in the '80s. Alone, and on top — with the greatest success of his career coming at age 40. 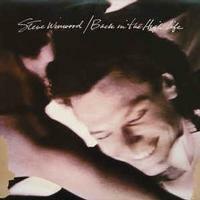 Released in 1986, Winwood's fourth solo studio album, Back In the High Life, became a Top Ten hit on the album charts in the U.S. peaking at No. 3. The album features the single "Higher Love" which topped the singles chart and won the Grammy Award for Record of The Year in 1987. The album received multiple Grammy nominations including Record of the Year and Album of the Year. Winwood is joined by many top artists throughout the album including Joe Walsh (slide guitar and guitar on 2 songs), James Taylor (backing vocals), James Ingram (backing vocals), and more. Customer Reviews (2.00 Stars) 1 person(s) rated this product. I’ve always loved this album. I still have my old original 1986 copy, but it’s taken some abuse since I was a kid. I was excited to see a new pressing available. Unfortunately, it sounds pretty awful. It’s muddy and veiled, as well as very noisy. My old copy, despite all the scratches, sounds much better. After cleaning both, same results. Hunt down a used copy of this album. One turned up here a few weeks- and I bought it. The second star is for the music itself and for its availability in general.